After all innovations, Apple is pretty bad with file management. My wife has a MacBook Pro with a 120GB hard drive. I know this does not sound big, but for her usage it should be enough. She has around 12 GB of music, a few office applications and some movies. All together should not be more than 60GB, however her hard drive is full. I told her to use our server for her music but she does not trust it. I was in charge to make her notebook faster and free of disc space, because she had only 1 GB left and I needed at least 5 to install Lion. First I looked in her trash and she really never empties her trash. There were deleted files from over one year and at least 300 iPhone apps which got deleted when she did sync and a new update was available. Empty the trash gave me 2 GB. I could not believe. Then I deleted her download folder, there were another 6 GB. I deleted as well some files, I knew she would not use anymore. After one hour I had 11 GB left. Enough to install Lion. After Lion install we had actually 13 GB left because some software got deleted because they don't run under Lion. Today she decided to update the OS of her iPhone. But it crashed during upgrade. She went to restore and tried it again, it crashed again. And she tried again and so on. After 8 attempts the restore did mot work anymore, because her HD had only 64 MB left. What happened? Itunes makes a backup, every time when you try to make a restore. She had at the end 12 backups. The backups made her HD full each backup was between 1 and 2 GB. Apple does compress the data really well but still, it is a lot. Deleting the backup gave her a lot of disc space back. Then I looked how many apps she has in iTunes. I could not believe what is saw, she had over 200 apps. No wonder the HD was full. Imagine an app is between 20MB to a few hundred like Pages. All apps together are, in her case, over 10 GB. Some games are really big. we deleted the apps from iTunes, but when she synced most of the apps came back. We had first to deselect them from iTunes, sync the phone to get them from the phone deleted and then we could delete them from iTunes. Now we have enough disc space available but I think I end up to buy her a 250 GB hard rive, which costs just $50 at Macsales.com. Apple is not anymore just for geeks, it is mainstream, but I feel the file management is too bad for users like my wife who is a typical end user. Especially now where the new Macs are coming with SSD drive which are as low 64GB. I understand that the new iOS 5 will allow update over the air and maybe the backup is stored in the cloud, but if not, a lot of people will be in trouble. If Apple wants to get number one computer and OS company then they need to change a lot. They should take an example from the automobile industry. When we buy a car, we don't need to know when and how to change oil. The car is telling us we need an oil change and then we just go around the corner and get it done for a few bugs. Apple PCs should work the same. It should tell us to empty the trash, or warn us to delete some backups or apps which we don't use. Windows is not perfect but at least it asks us every so often if we want delete certain apps we did not use of a year. All the time when she downloads something from a website, even of it is just a pfd, will be saved in a download folder. Why is Apple not asking us to empty the download folder once a while. Why does a PDF need to be saved on the computer? Windows asks us at least if we want to save or not. Her safari does download the file and open It. Apple could easily have in default settings that 3 GB of storage must be free or the user will be warned. Something like this. Let us compare the MacBook Air and iPad. Both can have 64 GB of memory. The iPad as maximum and the MacBook Air as minimum. For the iPad it is plenty, because I can sync with my iMac. Therefore I don't need to have all my music or video on the iPad. And I can delete apps I don't need and have them still on my big computer. And the biggest apps, I did find so far were only pages, numbers and keynote each of them multiple hundred MB. The MacBook Air, the most beautiful notebook starts for $999 with 64 GB. This sounds enough, if we consider that 3 years ago 40GB was common in a notebook. But I believe it is not. 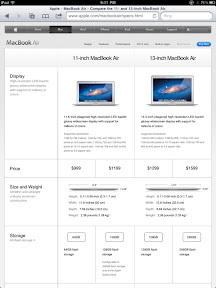 People who are buying MacBook Airs don't have usually an iMac or a server at home. But they might have an iPad, learned that they need more and ended up to get the MacBook Air (like my wife wants). Most apps for OS X are much bigger than for iOs and we still will sync out iPad and iPhone with the MacBook Air. 64 GB are just as fast full as we needed to decide if we get 64 GB or 128 GB. Another problem is the build in autosave. Lion and certain Apple apps are cool. You open pages and it opens the last document you worked on. You even never need to save a document. Apple does it for you. Not only this, Apple has build in version control. Which is very awesome. However all this is eating HD space. I am starting to wonder in which category the MacBook Air is going to be. Is it a notebook replacement or an iPad replacement? Does Apple expect iPad users will move to McBook Air and then to MacBook Pro? Or are they aware of the bad file management and are working on the perfect cloud? To keep most of the data in the cloud and only sync what is necessary? Everybody who has a full HD should do what i did. 1. Empty trash at least once a week. Every sync with iPhone or iPad will pit a lot apps into trash. 2. 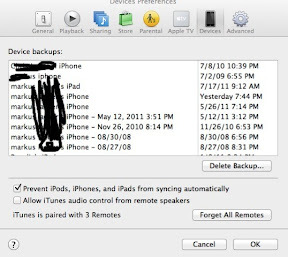 Delete through iTunes iPhone and iPad backups which you don't need. 3. Clean your iPhone, ipad and ipod touch apps from you device and then delete them from your computer. 4. Empty once a month your download folder. 5. Don't buy a MacBook Air with 64GB. If you really want, then buy as well a time capsule or an mac mini for your music, movies and other files. Use either of them as a file server. This will help you a lot in the long run. You're so awesome! I don't think I've read through something like that before. So nice to discover someone with genuine thoughts on this subject. Really.. thank you for starting this up. This website is one thing that is needed on the web, someone with some originality!